Why The Snooze Button is Ruining Your Sleep” is an article written by Sophia Breene. Here, she explains that the history of the alarm clock begins in 1787 and it has been constructed by Levi Hutchins from New Hampshire. This alarm clock was set to ring every morning at the exact time, at 4:00 a.m. A few centuries later, Westclox presented its “Drowse” line of electrical alarm clocks, which had a 5-10 minute snooze function. Today, the snooze function is being used, and even abused, by almost every household. According to one survey, over one-third of Americans hit the snooze button three or more times on daily basis. Also, more than half of people between 25 and 34 hit snooze on a daily basis. 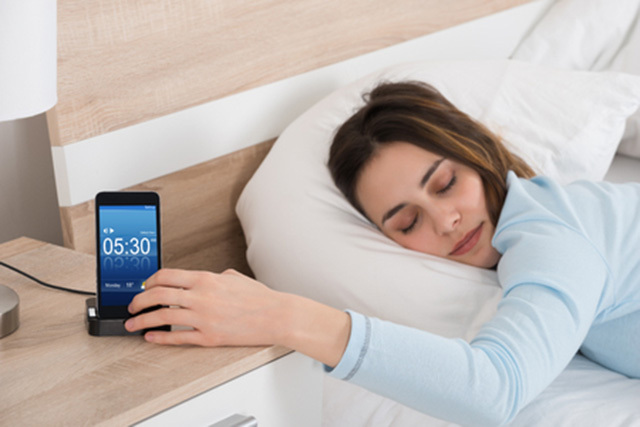 In order to understand why an alarm clock and this subconscious habit is ruining our sleep, we need to look at the biology of sleep cycle at the first place. During the sleeping cycle, the body switches to different brain level state, out of which the REM state is the most important. Before our bodies awaken, the brain sends out cortisol and adrenaline, hormones which help us to shift from the REM state to a lighter state of sleep. The triggering of the alarm clock interrupts the natural weakening process, as it is sudden, early and shocking to the body. Hence, we feel groggy during the entire day. Hitting the snooze button many times, especially if we haven’t had enough sleep, actually deprives our bodies of the most crucial type of sleep. Depriving ourselves of this type of sleep is very bad, as it oftentimes has a harmful effect on our cognitive abilities. Getting more sleep is the simplest solution. You should try to set the alarm for the actual time you get out of the bed, after the last snooze. In case this doesn’t work, leaving the alarm clock far from your bed so that it forces you to get up will surely do work. If you are one of the ones who simply cannot live without the snooze function, try setting a strict limit for yourself. Allowing yourself to hit the button only ONCE significantly minimizes the deprivation. Of course, 10 minutes of interrupted sleep is definitely better than 30. Probably the best and long term solution lies in utilizing the body`s circadian rhythms. This can be achieved by sticking to natural waking and bedtime schedule. By going to bed and waking up at the exact time every day and night, you are basically training your body and brain to wake up without the alarm clock.